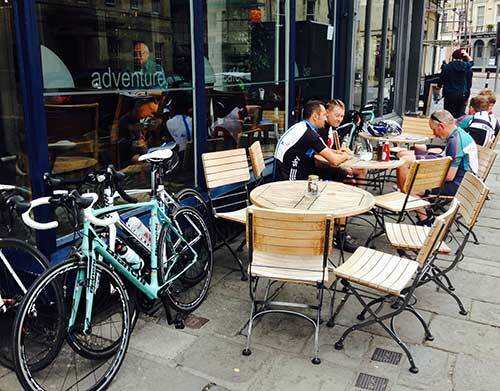 If you’re in Bath and looking for a place in the sun to park your bike and watch the world go by, then the Adventure Cafe is perfect. It’s at the top of Milsom Street, so bang in the thick of things (albeit at the ‘old’ end of Bath and not the new Southgate shopping centre end) and on a busy road, so it’s noisy and has that feel of city dust… but, hey, it’s Bath, so it’s not that bad. The Adventure Cafe has been a regular haunt since we moved this way almost 15 years ago, but they’ve kept up the standards and continue to provide great food and decent coffees. When the Malmesbury Peloton arrived en masse a few weeks back, we were lucky to find all of the tables outside free, so claimed two of them and set about refuelling for the return trip. While the Adventure Cafe does a sterling English breakfast, I can confirm that the Eggs Royale are fantastic.